After three rounds of testimony from people demanding decent sidewalks, the City Council’s Sidewalk Working Group will try to fix the dysfunctional policies that have contributed to Denver’s Swiss cheese network of crumbling sidewalks. At least one in four of all trips in Denver are less than one mile, according to the Denver Regional Council of Governments — those are trips that people can walk in about 20 minutes or less. But fewer than 6 percent of trips are made on foot. Denver’s disorganized patchwork of dangerous sidewalks is a big obstacle to walking in the city. And looking at the problem at a finer scale, a major issue is that low-income neighborhoods have worse walking infrastructure than wealthy ones, because the costs of sidewalk construction and maintenance are expected to be covered by adjacent property owners. 250 miles of streets don’t have sidewalks. 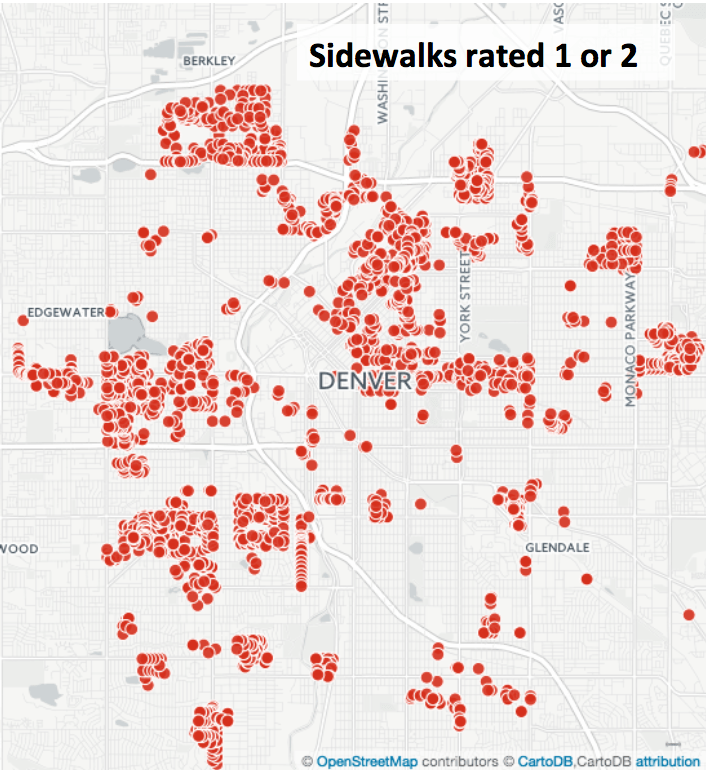 Of the streets mapped for WALKscope Denver, 35 percent of sidewalks are rated to be in very poor or poor condition. 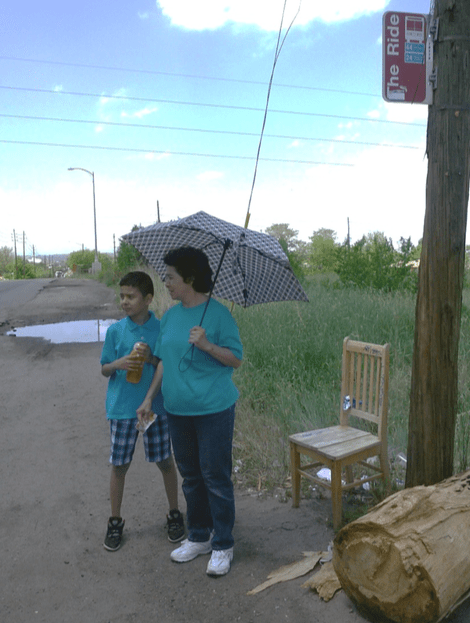 Bus stops were the topic of Thursday’s meeting, the Sidewalk Working Group’s final “information gathering” session. RTD revealed that it does not build sidewalks at bus stops — just the concrete bus pads where buses stop. It also came to light that the city would probably not be liable if someone in a wheelchair got hurt waiting for the bus in the street, because the sidewalk lacked curb ramps. The city “enjoys a lot of governmental immunity from claims related to pedestrian safety,” according to Assistant City Attorney David Broadwell. Now that the hearings are over, council members will get down to business and deliberate actual solutions. Advocates want the city to be more accountable for sidewalk conditions and to devise long-term sources of revenue to fund walking infrastructure. WalkDenver and Public Works estimate that if the average property owner paid $75 a year, the city would raise enough money to have a legitimate sidewalk on at least one side of every street within 10 years. City Council members will draw ideas from other cities that have built better sidewalk networks, including some Denver suburbs that have outdone the Mile High City. Advocates are optimistic. This is the most sustained, serious attention sidewalks have ever received in Denver, they say. On Thursday, WalkDenver handed council members a petition with nearly 3,000 signatures and 34 support letters from neighborhood organizations. Among the signatories is the umbrella group Inter-Neighborhood Cooperation, which has advocated for comprehensive sidewalk policy for 10 years. All agreed: it’s past time for Denver to do something. Good news! It’s like pulling teeth to get many cities to change their outdated, 19th century sidewalk policies. I hope Denver sees the light — its suburbs already have!